Trump: 'We're really rocking' Jump to media player Donald Trump has won a decisive victory in the Republican primary in his home state of New York. 'Donald Trump's talking my language' Jump to media player What's the New York state of mind? A Donald Trump supporter from Buffalo talks to the BBC. Why the New York primary matters Jump to media player New York is neither first nor last on the election calendar, nor does it hold the most delegates for either party. So why has winning here become so vital in this presidential election? 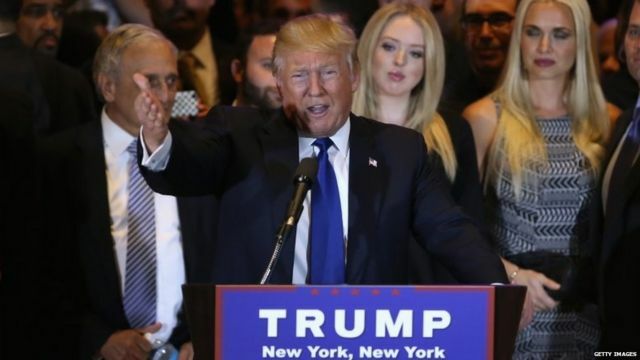 Donald Trump has won a decisive victory in the Republican primary in his home state of New York. This is what he had to say after his win.